Origin and Habitat: Disocactus phyllanthoides is endemic to Mexico, and is distributed in the states of Puebla and Veracruz. It was recently reported from the state of Hidalgo too. This species is not very common, however it is difficult to distinguish from similar species unless it is in flower so estimates are difficult. Altitude range: The species is found at elevations of 1,500 - 1,850 metres above sea level. Habitat and Ecology: This species is an epiphyte (and sometimes grows on rocks). The species occurs in cloud forest. This epiphytic species is considered Vulnerable due to past and ongoing declines observed over the past three generations (30 years) as a result of deforestation for conversion to coffee plantations, small scale farming and cattle ranching. This epiphytic species is entirely dependent on forest and loss of forest results in direct loss of subpopulations and mature individuals. In addition, around villages and towns the species is declining due to over-collecting. The species is used locally as an ornamental and is commonly grown as an ornamental houseplant or sometimes naturalized. Description: Disocactus phyllanthoides is a pendent, epiphytic, freely branching, perennial cactus up to 60 cm tall and to 1 m in spread. The stems are flattened, toothed, glossy, green, each about 4 cm wide. The areoles on the margins each bear weet-scented pink flowers, to 10 cm across, in spring. Height 60cm, spread 1m. There is a need to review the taxonomy of this and other Disocactus species. Some experts still treat this species under the genus Nopalxochia. This species, like others of the former Nopalxochia, shows affinity to Webereocereus making the systematics of this group even more complex. Derivation of specific name: The epithet Phyllanthoides (Latin) = similar to phyllanthus. 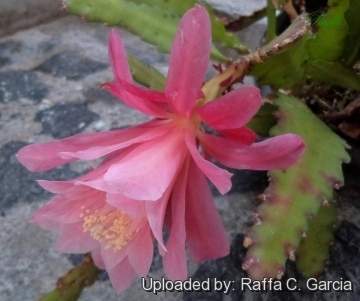 This species was among the first flat-stemmed species to be described, and the name recalls that it is similar to the first described flat-stemmed cactus Cactus phyllanthus today - Epiphyllum phyllanthus. Stems: Primary stems to 40 cm long and 6 mm in diameter, woody, stalklike, round in cross below, flattened at apex. Lateral (secondary) stems lanceolate, flat, with terete, stalk-like base, 15–30 cm long, 2.5–4 cm overall, 2.5-4 cm wide, nearly smooth, light green, often red tinged, pointed, coarsely crenated or scalloped, obtusely toothed,with prominent midribs and lateral veins. Areoles: Spineless except for young growth. Flowers: Diurnal and scentless, campanulate to funnel-shaped, produced on year old branches, pink, 8–10 long, 7–9 cm wide. Pericarpel ovate with a few spreading bracteoles. Tube (receptacle) 2.5–5 cm long, 7–10 mm in diameter, greenish, scales more numerous than on the pericarpel, naked in the axils green to blackish purple. Limb rose-pink, outer perianth-segments lanceolate, opening irregularly before flowering, then spreading widely; inner lanceolate-obtuse, remaining more or less erect pink, paler inside. Stamens, style and stigmas whitish. Stigma lobes 5-7. Fruits: Ellipsoid, green at first, later red, with ribs, 3-4 cm in diameter. Remarks: Some cultivar names are in use, but there are no evidence that these differ from the original species - 'Deutsche Kaiserin', 'Empress', 'German Empress'. However, 'Giant Empress' represent a somewhat larger clone with more uniform pink flowers. 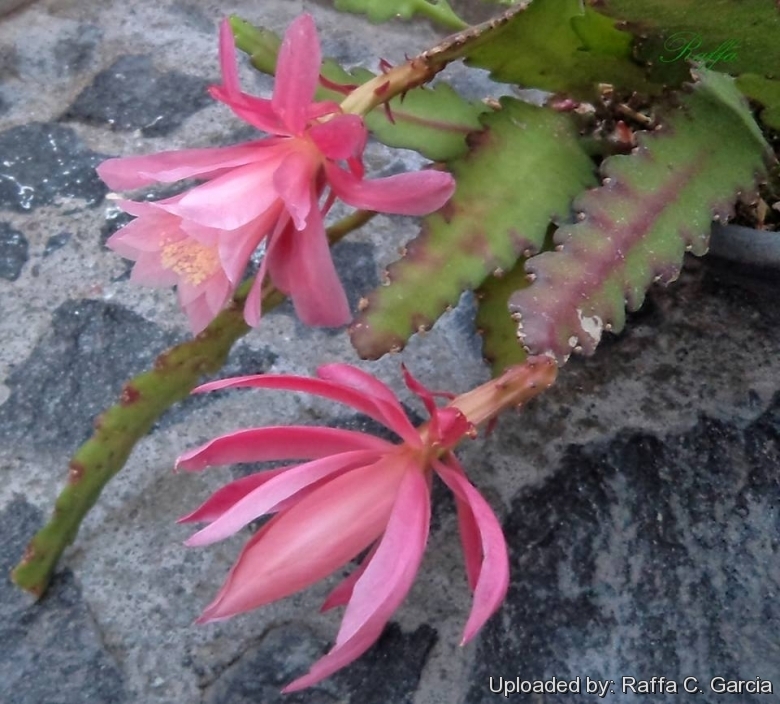 Notes: Disocactus phyllanthoides is one of the three major species involved in creating the widely grown epiphyllum hybrids or orchid cacti known today. 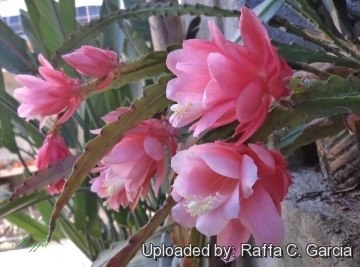 The others are Disocactus speciosus and Epiphyllum crenatum. Other species have been used, but not by far to the same extent as these three. 1) Hernández, H.M., Gómez-Hinostrosa, C. & Cházaro, M. 2013. Disocactus phyllanthoides. The IUCN Red List of Threatened Species 2013: e.T151739A556147. http://dx.doi.org/10.2305/IUCN.UK.2013-1.RLTS.T151739A556147.en. Downloaded on 15 June 2016. 2) Hunt, D., Taylor, N. and Charles, G. (compilers and editors). “The New Cactus Lexicon.” dh Books, Milborne Port, UK. 2006. 3) Anderson, E. F. “The cactus family.” Timber Press, Portland, Oregon, USA. 2001. 4) Wikipedia contributors. "Disocactus phyllanthoides." Wikipedia, The Free Encyclopedia. Wikipedia, The Free Encyclopedia, 10 Oct. 2015. Web. 15 Jun. 2016. 5) Guzmán, U., Arias, S. and Dávila, P. “Catálogo de Cactáceas Mexicanas.” UNAM-CONABIO, Mexico City. 2003. 6) Ponce-Vargas, A., I. Luna-Vega, O. Alcántara-Ayala and C.A. Ruíz-Jiménez. “Florítica del bosque mesófilo de montaña de Monte Grande, Lolotla, Hidalgo.” Revista mexicana de biodiversidad 77: 177-190.2006. 7) Stoie, A. “Ex situ conservation of several species of succulent plants in the Cluj-Napoca agrobotanical garden.” Not. Bot. Hort. Agrobot. Cluj 35(2): 39-47. 2007. 8) Botanical Magazine, 2092 (1819) – as Cactus phyllanthoides. 9) Haustein, “Der Kosmos-Kakteenführer”, 97. 1983. 12) Véliz Pérez, M. E. “Cactáceas Guatemala 1–129”. Univ. de San Carlos de Guatemala, Guatemala. 2008. Cultivation and Propagation: Disocactus phyllanthoides is easy to grow and tolerates neglect. 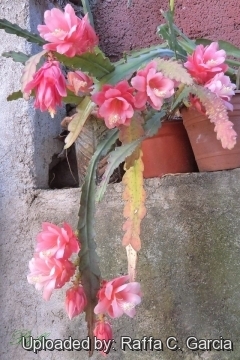 This plant (as with all Disocactus) prefers partial shade, and requires ample summer water (more than other cacti), but allow soil to dry slightly between waterings. Plants held under proper conditions can produce flowers at least three times a year, but the main flowering period is spring. This plant probably has been in cultivation since prehistoric times by the Indigenous peoples of South America and Mesoamerica. Exposure: It grows best in dry, tropical or subtropical climates, it need full sun to partial shade. Shade is sometimes provided in hot climates. Extra light in the early spring will stimulate budding. Soil: Disocacti aren't usually too picky as to soil type, but because of their epiphytic nature, it is recommended to grow them in well-drained soil mix largely composed of organic material, such as peat or sphagnum moss. This type of soil would normally be used for orchids, bromeliads or other epiphytic plants. Hardiness: Prefers nighttime temperatures no cooler than 12° C, especially in the winter. Will tolerate temperatures to 45° C, and short periods of frost, but prolonged cold will damage or kill the plant. Propagation: Disocactus phyllanthoides is propagated by stem cutting or (rarely) by seed in the spring. Seed should be sown in well-drained compost and should germinate in 14 to 28 days at 18 to 21° C.